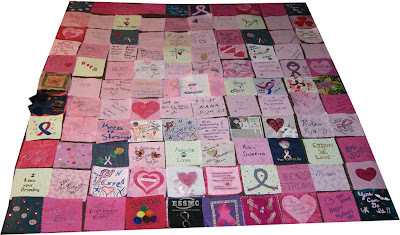 I now have the quilt layout decided upon for the second Breast Center Quilt for the Cure quilt. It seems that the more variety of blocks that are presented, the longer it takes to decide upon a favored layout. Here it is.. There is only one block that kinda sticks out of place for me. it's the big blue velvet bow on the middle left side. But, there it will stay. Now it's time to sew these two quilts together. That should go pretty quick. My favorite are the 4 center corner denim embroidered roses.